Dhaka, 6 October, Abnews: French police said Friday they are probing the disappearance of the Chinese head of Interpol, who has reportedly been detained for questioning in his home country. Meng Hongwei 64, was last seen leaving for China from the international police organisation’s headquarters in Lyon, southeast France, in late September, a source closed to the enquiry told AFP. His wife has since reported him missing. “He did not disappear in France” where he lives, the source told AFP. France’s Europe 1 radio reported that he left the country on September 29. But Interpol would not be drawn on his possible whereabouts. 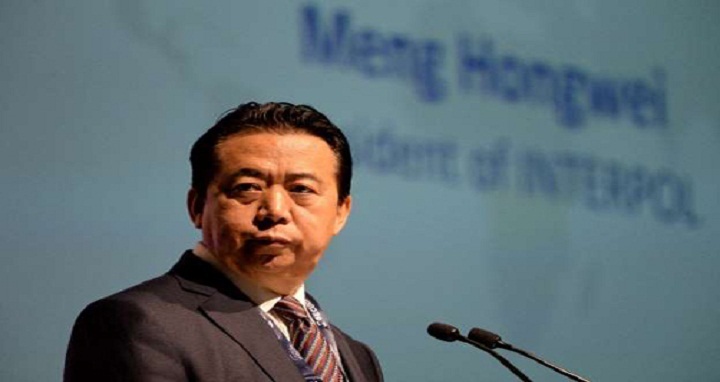 “We are aware of media reports in connection with the alleged disappearance of Interpol President Meng Hongwei. This is a matter for the relevant authorities in both France and China,” it said on Twitter. The Hong-Kong based South China Morning Post newspaper reported that Meng was under investigation in China. He was “taken away” for questioning by the authorities “as soon as he landed in China” last week, the paper said, quoting an unidentified source. It was not known why Meng was being investigated. Before being elected head of Interpol in November 2016, Meng was vice minister of public security in China. He also ran the Chinese Interpol office. The Post said Meng was listed on the website of China’s Ministry of Public Security as a vice-minister, but added that he lost his seat on its Communist Party Committee, its real decision-making body, in April. Critics suggested that Meng’s election gave Beijing a chance to enlist more international help in tracking down alleged economic criminals, including corrupt officials, targeted by President Xi Jinping’s anti-graft campaign. But Interpol has in the past denied this, saying its head does not intervene in day-to-day operations, which are handled by secretary-general Juergen Stock, a German. Some critics also view the campaign as a way for Chinese leader Xi Jinping to purge the party of political foes. Since it began, several top officials have been detained and charged with crimes including “severe disciplinary violations”, a phrase which usually refers to corruption or graft. A number of well-known Chinese figures have gone missing for weeks or months in recent years. One of the more public cases was that of Chinese superstar Fan Bingbing who only recently returned to social media after dropping off the radar in May. The 36-year-old actress, model and producer, re-emerged this week, apologising in a statement to fans and to the Communist Party for tax evasion, after news broke that she had been ordered to pay nearly $130 million (113 million euros) in back taxes and fines. In other recent cases, the shares of a Hong Kong-based casino operator, Landing International Development, plunged in August after the firm reported that its chairman Yang Zhihui could not be found. Billionaire Guo Guangchang, chairman of one of China’s biggest private- sector conglomerates Fosun, also vanished from public view in 2015 in connection with an investigation by authorities, and then re-emerged.